Full Color, Indoor & Outdoor Custom Vinyl, Mesh & Fabric Banner Printing. Vinyl banners provide an inexpensive way to get your message or brand in front of your customers. These durable banners stand up to the elements, indoor and outdoors, and help draw attention to your business or organization. Custom printed banners can be printed in a wide selection of sizes, shapes and colors. We offer a variety of hanging options like Grommets, Pole Pockets and Banner Stands so you can display your Banner anywhere. Highly visible outdoor banners draw attention and raise awareness for your organization or brand. Versatile, durable and affordable, banners provide low cost, high-impact advertising, even from a distance. Promote an event, product, brand or service with outdoor banners and make a lasting impression. Indoor banners can make a great impact and generate excitement. 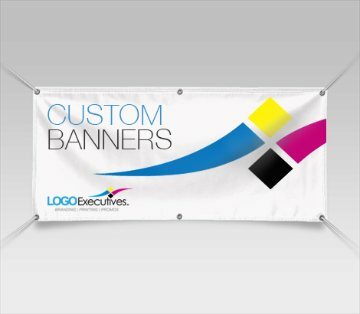 One of the most cost-effective and inexpensive advertising products available, banners draw attention to promotions and tradeshow booths. Whether you want to promote a new product, create brand awareness or promote an event, indoor banners are a great choice. Retractable banners are a portable and easy way to take your message on the road. Easy to setup and tear down and small enough to take with you on the go. With many sizes, shapes and options avaialbe, Let LOGO EXECUTIVES help you design the perfect custom banner that will allow you to promote an event, tradeshow booth or sale wherever you go. Choose from a wide range of quality banner stands to display your banners. From economy stands to retractable banner stands with interchangeable graphic cartridges, we have banner stands for every business. These free-standing vertical stands make a dramatic impact at tradeshows, meetings and conferences. Make a big impact with Full Color Banner Printing. High Resolution, Photo-Quality Banner Printing on heavyweight indoor and outdoor banner material. Hemmed and Grommeted edges. Standard and Custom Banner Sizes. Large Format Banners, Signs and Flags. We print large format vinyl banners on 13 oz. vinyl at high resolution in 4-color process for indoor & outdoor use. Our state-of-the-art process delivers crisp consistent colors and high resolution reproduction for clear sharp images and text at almost any distance. Go to http://store.logoexecutives.com/signs to see more Banners, Banner Stands and Banner Display Options. Contact LOGO EXECUTIVES for additional Banner sizes and display options at (702) 589-6429.